When it comes to cloud, there are a number of misconceptions and questions surrounding the technology’s use cases, implementation and management best practices. Two areas in particular – cloud APIs and disaster recovery – have become increasingly common topics of debate recently. With APIs offering a set of protocols that are critical for integrating enterprise applications and workloads with cloud environments, and cloud disaster recovery helping organizations protect data during unexpected disruptions, both are equally important for cloud users to fully comprehend. 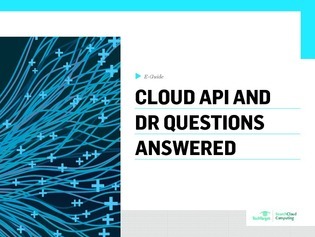 In this e-guide, learn the answers to frequently asked questions about proper cloud API and disaster recovery set up and management so you can ensure you get the most from your investments.